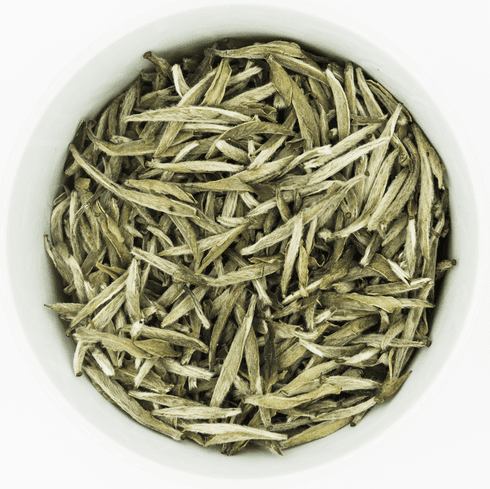 Ten Ren's Superfine White Tea is also known as White Down Silver Needles. This rare tea consists of only singular tender buds picked in Spring before they open. The reason for the name, White Down Silver Needles, is quite apparent with one glance at the buds. The prominence of the delicate white hairs on the buds is quite striking. Tea brewed from these buds have a pale yellow hue with a light honey-sweet scent. Its taste is delicate with a clean mellow sweetness. The aftertaste is fresh. The water used to steep this tea should be about 160-180�F or 70-80�C. Use about 2 tablespoons (3 grams) of tea leaves for about every 5 ounces (150 milliliters) of water. A steeping time of about 3-5 minutes with more or less time recommended depending on desired concentration. As a rough guide, the higher the temperature of the water or the greater the amount of leaves used, the quicker the steeping time should be. The use of a ceramic or glass cup is recommended to enjoy the look of the leaves.